Hold a piece of U.S. history with this beautifully-crafted pen made from one of America's most historic trees. Buy a unique gift for a friend, history buff or family member. The stories of history are preserved in our handmade treasures. History of the wood: Washington states in his diary that he planted five of the mulberries in the Serpentine Walk around the Bowling Green on the 28th of February 1785. The tree still stands today at Mount Vernon. We were able to reclaim a very limited amount from a large branch that came off in a windstorm. 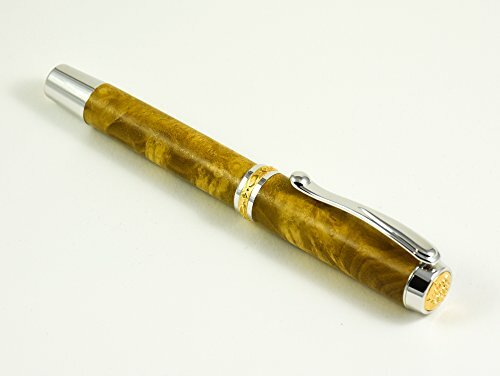 Specifications: Fountain Pen, junior size (5 1/4"x 9/16"), white mulberry wood, rhodium/22K gold trim, non-postable cap. All pens arrive with a Certificate of Authenticity and a complimentary non-historic wood box. View More In Pens & Pencils. If you have any questions about this product by Historical Woods of America, contact us by completing and submitting the form below. If you are looking for a specif part number, please include it with your message.